﻿ Real Madrid 4-2 Kashima Antlers. World champions in Japan! 18.12.2016 » Real Madrid 4-2 Kashima Antlers. World champions in Japan! Real Madrid was crowned World champions for the 5th time in the club's history, after beating Kashima Antlers 4-2 this Sunday morning in Japan. Cristiano Ronaldo was the man on the match and completed another hat-trick for the Merengues. Real Madrid are on the top of the world! Zinedine Zidane's men finished 2016 with another win and will travel back to Spain with another trophy in the bag. The Merengues beat Kashima Antlers in overtime 4-2, after being surprised by a very resilient side in the course of the first 90 minutes. 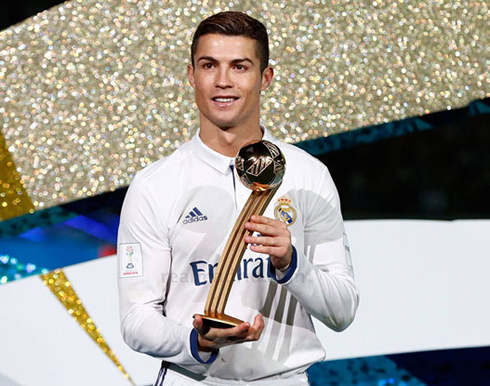 The match ended 2-2 in regular time, but after having already scored a penalty-kick in the second half, Cristiano Ronaldo added another two goals to his name during the overtime's first half, setting the final score in 4-2 to Madrid. It's now time for Zinedine Zidane's men to enjoy a 3-week break, with their next match only coming on January 7 of 2017 for La Liga, against Granada. On paper, Real Madrid went into this game as heavy favorites. However and judging from what we've seen on the pitch, it turned out things weren't as easy as many had expected. The Japanese side showed a great fighting spirit and group cohesion, putting on an almost perfect display against the European champions. Zidane made only 1 change to his side when looking back at the lineup he had picked for the semifinals game against Club America. It was the captain Sergio Ramos who returned to his usual spot in the center of defense, but the truth is that it didn't exactly grant Madrid more safety at the back. The Japanese side tied the game just before the break, when Shibasaki	picked up a bad clearance from Varane and beat Keylor Navas with a left-footed strike. Surprise in Yokohama and things would get even more complicated to Real Madrid when the same Shibasaki scored a second goal shortly after the break, putting his team on the driving seat and 40 minutes away from glory. It was then time for the best player in the World to step up. Cristiano Ronaldo tied the game at 2-2 in the 60th minute, converting a penalty-kick where he gave no chance at all to the Japanese goalkeeper. The scoreline didn't change until the end of regular time, but shortly after it resumed, Ronaldo struck again and in double dose. First he finished off with his left after being assisted by Benzema and then he picked up a half shot half pass from Toni Kroos to complete his hat-trick again with his left foot. 4-2 to Madrid and World champions! What a way to turn the page and finish the year! Cristiano Ronaldo next game is a La Liga fixture, on January 7 of 2017 against Granada. You can watch Juventus live stream, Real Madrid vs Granada, Barcelona vs Espanyol, Everton vs Liverpool, Inter Milan vs Lazio, and Borussia Dortmund vs Augsburg, all matches provided from our live soccer game pages.